A prefabricated fence that has 9 horizontal twines (8 conductive); is 35" tall installed, and has large white plastic vertical struts every 12". It's used to keep sheep, goats, guard dogs in while keeping out stray dogs and coyotes. Can be used for cattle and domestic hogs. For fences that involve curves, corners and directional change, or when aesthetics are a concern, “Plus” nets include additional line posts to reduce sag. 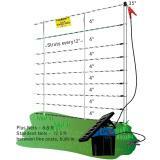 Line posts are spaced every 6'8" (vs. 12.5' for standard 35" ElectroNet). Each roll is a complete fence with posts already built into the mesh/fence. One roll (100 ft) weighs only 13 lbs. You will need a fence energizer to electrify the net. Which ElectroNet® is right for you? We offer many fences to fit your situation, including multiple lengths with different post spacings, drivable line posts and positive/negative options for dry soils. Visit this link to compare all ElectroNet options. Used to keep sheep, goats, guard dogs in while keeping out stray dogs and coyotes. 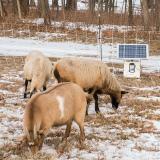 Can be used for cattle and domestic hogs. Can also be used for beehive protection to keep out livestock and bears. No extra gates needed. Just turn off the energizer and pull the first post to create an opening. For added convenience, an ElectroNet® Gate can be used to provide easy access without the need to turn the energizer off. 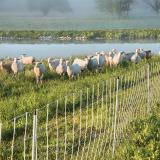 Contain sheep, goats and cattle and keep out predators such as coyotes, dogs and bears. Enclose rams and buck goats. 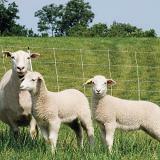 Make small pastures for animals that need special attention (ewes/does/nannies with triplets; injured or stressed animals). 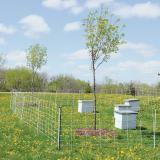 Effective for beehive protection to keep out livestock and bears. Strip grazing pastures, orchards, vineyards and stockpiled forages. As an interim fence until a more permanent fence can be built. Installing water gaps that work. Making lanes for moving animals. 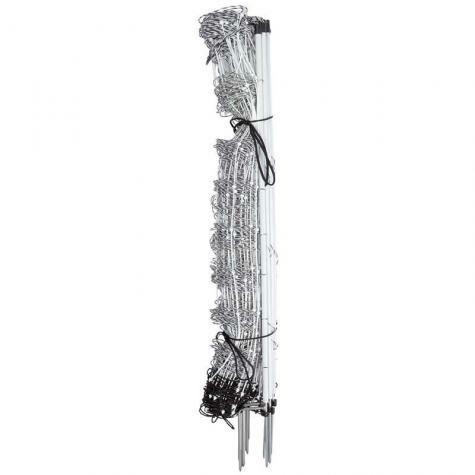 Horizontal Spacings 4", 4", 4", 4", 4", 4", 6", 6"
#201500 - $1.44 per ft (100' roll with double spike posts). 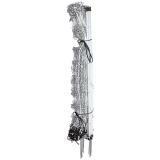 #201501 - $2.28 per ft (50' roll with double spike posts). 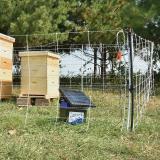 Fence was easy to install and it is working fine in my new apiary in central Virginia. The fence maintains a constant 8kV charge with the solar battery unit I purchased. This is by far the best portable fence we have ever purchased. It's strong and sturdy enough for the most push ram. 1) Premier uses 6 electrified wires per strand, many of the other manufacturers only use 3. 2) The step in spike is one piece of steel, rather than the plastic/fiberglass/steel mess some of the other manufacturers use, AND it already comes with a point on the end. It's much easier to step in. With my old fence I had to carry around a rubber mallet to get the spike in the ground. 3) Premier has a cleaner manufacturing process. That is, there aren't extraneous bits of extruded plastic at the joins (where vertical and horizontal strands meet) that tangle up the fence. This might sound like a little thing, but when you move your fence every couple days it adds up. Easy to install (I watched the online video). I was a little skeptical because our soil is rocky and we live on a hill, but the fencing went up quickly and easily. My husband didn't have a problem getting the double pins in, but I found a hammer made it much easier for me in our really rocky places. Worth the money. I'm planning on buying more. 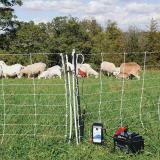 I also use it for temporary fencing for our horses when I want to give them additional grazing. After buying electric netting from another company and having several bad experiences with them, I was not easily convinced that this netting would be worth buying. I didn't want to waste more time or money. I didn't want anymore escapees. This netting more than exceeded my expectations. There is a learning curve and it took me a few times of moving and adjusting my habits, but once I got it down I was thoroughly impressed. In fact, I bought six more after the initial six! It keeps my goats and my lambs fenced in.